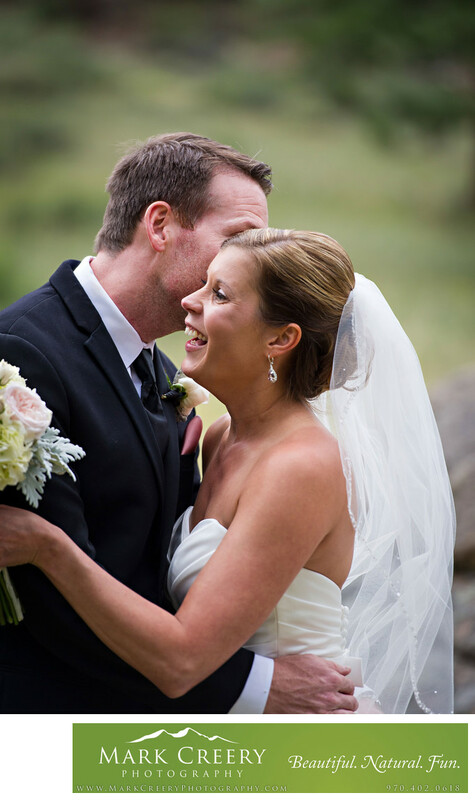 Perry Park Country Club is an idyllic location for wedding photography in the mountains. The ceremony site looks onto Lake Wauconda, with the mountains of Rampart Range and trees all around behind the couple as the guests watch on. There is always lots of lush green grass in the summer, even when natural grass has all dried up. There are some seriously cool rock formations to go explore for bridal party photos, like Sentinel Rock. The reception takes place in the historic Manor House, which was built in the 1860's. It is a rustic and charming location, with so many photography possibilities. This portrait is of the bride laughing as the groom whispers something charming, funny, or naughty (not sure which!) in her ear to get a reaction. Since the groom is mostly an accessory to the beauty of the bride - it's her day she's been dreaming about her whole life after all - it's his job to make her look good. Sometimes I remind them that they can take an active role in their photography, and to have fun with it. Since these two were a bit more on the serious side, something like this helps get them in a more playful mood. Perry Park Country Club is located in Larkspur, Colorado. Contact: (303) 681-3305, wedding@perryparkcc.com. Location: 7047 Perry Park Blvd, Larkspur, CO 80118.